This year, approximately 233,000 men will be diagnosed with prostate cancer in the U.S. And more than 29,480 men will die as a result of it. Sometimes these numbers are hard for us to really understand because they’re so large. We don’t come across figures like this in every day life. We don’t buy 29,480 bananas at the grocery store. We don’t have 233,000 e-mails in our inbox (although we may feel that way sometimes). But wouldn’t it be great if we didn’t have to try and get our heads around them? If they shrunk to a quantity that we could understand? The good news is that together, we can start to make these numbers go down. You can help. How? 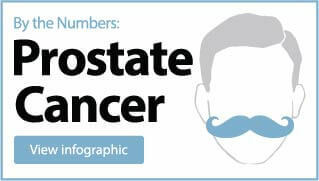 It’s important to know the risk factors and symptoms associated with prostate cancer. Risk factors are sometimes beyond a person’s control, such as their age, race, and genetic history. However, there are some everyday choices a man can make to prevent his risk of prostate cancer, such as eating a healthy diet, exercising to prevent obesity, and not smoking. In most cases of prostate cancers, symptoms may not appear until the cancer has progressed to advanced stages, but these symptoms include difficulty urinating or blood in the urine. If you’re male over 50, you can help yourself by getting screened. And if you’re female, you can help your husbands, fathers, and brothers by asking them to get screened. Prostate cancer screening is no fun, but it’s easy. And if it can help save your life, or the life of a loved one, it’s worth it. Prostate cancer is not invariably fatal. If it’s caught early enough, it can be treated and beaten. In fact, if the cancer is diagnosed at an early stage and can be contained to the prostate, the five-year survival rate is nearly 100 percent. That’s a number we can understand.